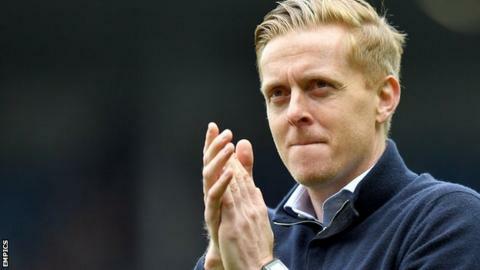 Garry Monk has resigned as Leeds United head coach, saying he is unable to "reach an agreement" with new owner Andrea Radrizzani. Monk quit on Thursday, two days after Italian businessman Radrizzani completed his takeover of the Championship club. The 38-year-old was appointed on a rolling one-year contract last summer and guided them to seventh in 2016-17. He had been expected to sign a new deal after the buyout of Massimo Cellino. Monk said in a statement: "It is with huge disappointment that my time at Leeds United has come to an end. "I saw myself at this fantastic club for many years to come. After discussions with the new owner, we have unfortunately been unable to agree a suitable way for us all to move forward together." Leeds had spent much of the season in the play-off places, but missed out on a spot in the top six after a run of just one win in their final eight games left them five points adrift. Monk, who spent 10 years at Swansea as a player before taking over as manager from February 2014 to December 2015, was the sixth full-time head coach appointed by Cellino during the Italian's controversial reign from June 2014. The club statement said they had "reluctantly accepted" Monk's resignation. It added: "While we are deeply saddened by Garry's decision, there is no individual bigger than our club." "Andrea made it clear to the media yesterday that his intention was to exercise the club's option to extended the manager's contract for another 12 months and immediately begin negotiations for a longer term deal. "Mr Radrizzani has met with Garry twice since taking over at Elland Road earlier this week and during the second meeting yesterday it became clear that Garry was considering life beyond Leeds United as at no time did Garry wish to discuss terms for a longer contract. "Following that meeting yesterday Garry's agent requested that the option was not exercised and his resignation was received this morning. "We thank Garry for his contribution during his time at Leeds United, we are disappointed that would could not continue on this journey together." Monk won 48% of his league games in charge of Leeds - 22 of 46 played - the fifth-highest percentage in the club's history. It's a real shock, especially in terms of timing. I think for Garry it wasn't about how much money he could earn but whether the club had the tools to provide him with the budget to take Leeds one step further than this season. I would imagine that has been a bit of an issue. I spoke to Andrea yesterday and he wasn't happy with how the season ended and felt there was room for Garry to improve but there's no doubt he did an amazing job. The last I heard from Garry's camp was that he was focused on Leeds but I would be amazed if they have not had enquiries from clubs such as Middlesbrough or Watford. Radrizzani is an ambitious guy and the next appointment is crucial. Aitor Karanka is going to be linked because I understand Victor Orta, who was Middlesbrough's head of recruitment, is coming to Elland Road. But at this stage it could be anyone.